Every so often something in the board game world comes along that just slaps you in the face and makes you think "wow". For me it was a post on imgur by TenMinJoe. 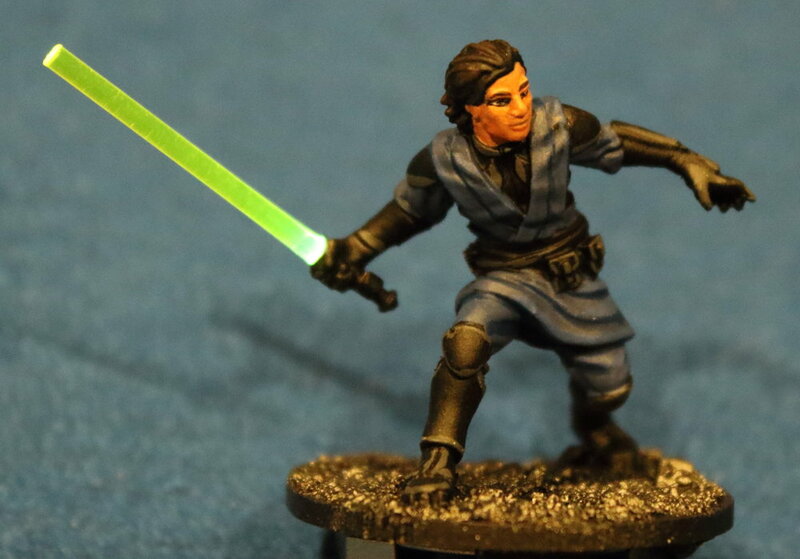 With amazing ingenuity she/he created a LED lighted lightsaber which could be applied to any existing or future miniature in the Imperial Assault board game lineup. Check out the re-post for yourself and be amazed. 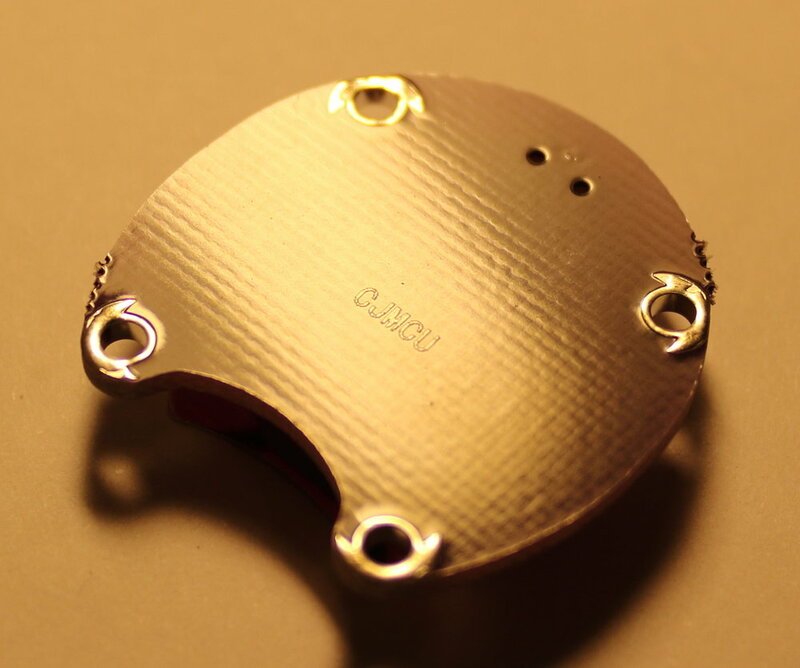 The unit used as the base and power source is called a "LilyPad Coin Cell Battery Holder," which costs about $3. The holder requires a CR2032 battery, and as an added bonus, has a built in on-off switch. The "back" of the unit serves as the top of the base on which to attach the miniature. TenMinJoe used the Davith miniature for this project. After cutting him off the original base and removing his standard lightsaber blade, she/he drilled a hole through his forearm-- from hand to elbow. The next step involved cutting an appropriately sized portion of the fluorescent acrylic rod to replace the removed lightsaber blade. It needs to be slightly longer so the end can be sanded down and inserted into the miniature’s empty hand. Two more holes were drilled to hide the wiring: one hole through the leg and one through the torso. 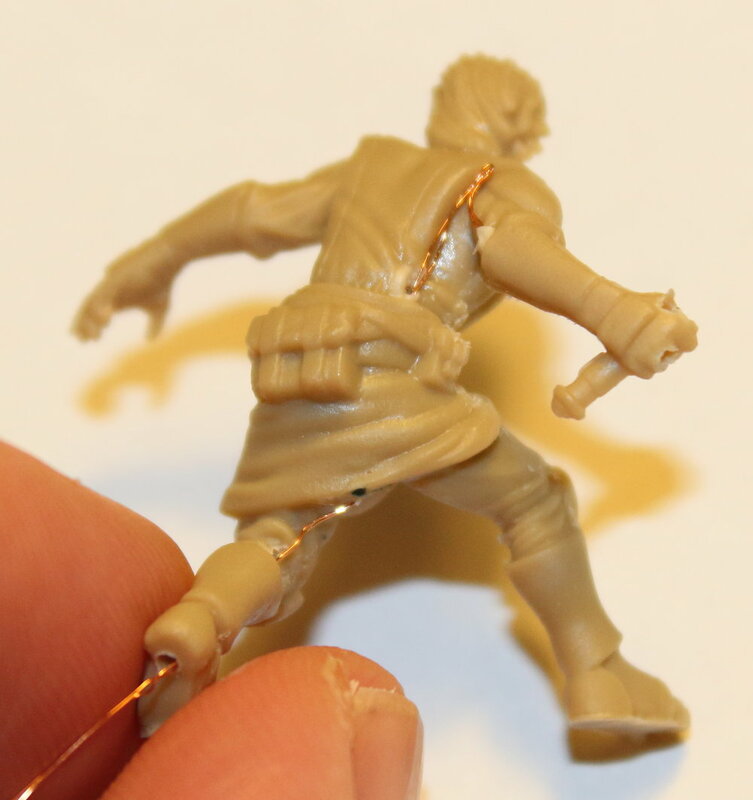 These holes allow the LED wire to be discreetly run to the final position of the LED in his fist. The LED used was a pre-wired C0402W surface-mount LED. If you buy a few at once they cost only $2 or so each. They are pre-wired with incredibly thin wires. The wires are coated in a thin layer of plastic, so touching the two wires together doesn't short the LED. The heat burns off the plastic where you're soldering. TenMinJoe recommends testing your wiring run before going further to make sure nothing has been damaged in the process of stuffing it through the holes in the model. You will also need a resistor to be wired in series with the LED or else the LED will be damaged and burn out quickly. 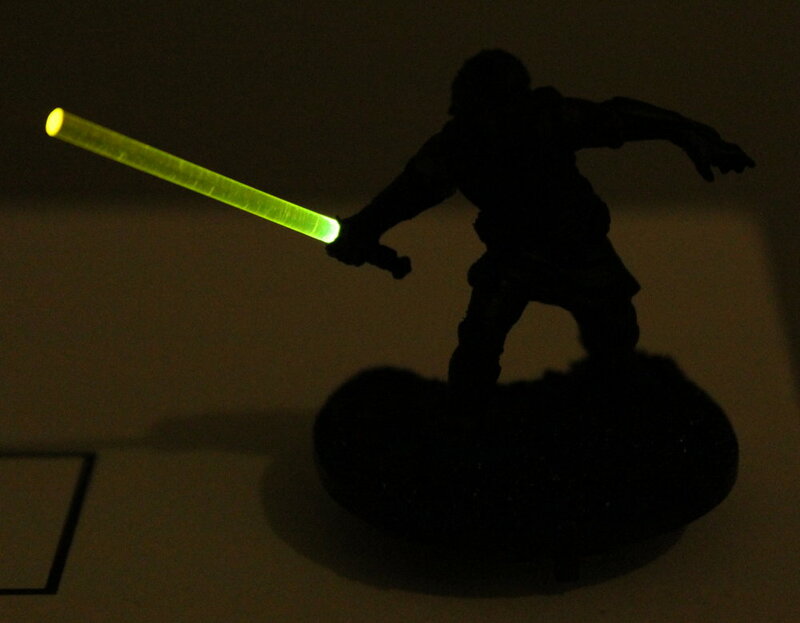 This model was created using a 620 Ohm resistor, but you could go as low as 22 Ohms if you wanted to have an eye-searingly bright lightsaber. To finish off the miniature, Games Workshop "green stuff" was used to cover the exposed wiring and plug the holes where drilling made a mess. TenMinJoe did the final soldering on the base after confirming everything was working one final time. LED wiring tip: the longer of the two LED wires goes to the positive terminal. Although with this simple circuit, if you got it wrong, you could always just flip the battery over. The finished product! It's frustratingly hard to capture the awesome “glowiness” of the LED with a camera, but TenMinJoe assures us that it is a really great effect in person.